CINCINNATI — Frustration, confusion. Downright anger. 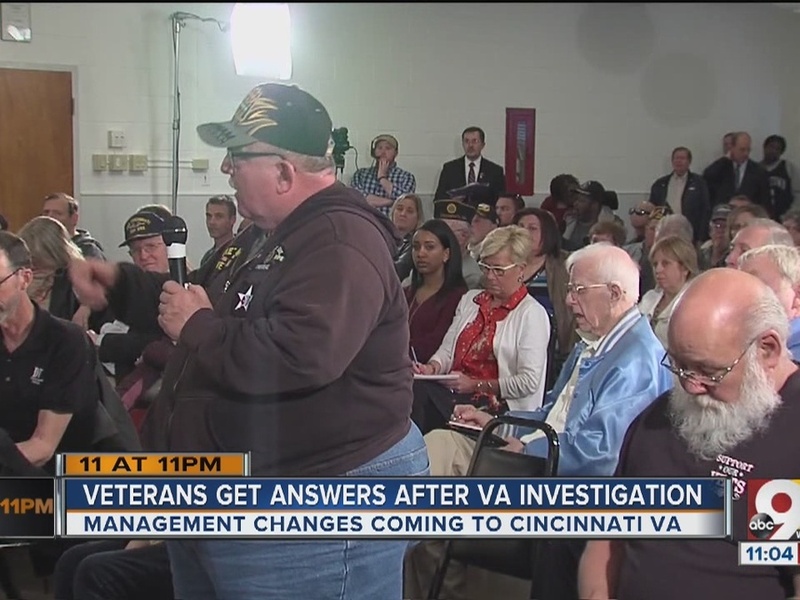 Those were just some of the emotions that flared Wednesday evening when veterans from all across the Tri-State gathered for a town hall meeting, hosted at the Sharonville VFW by WCPO and the Scripps Washington Bureau, regarding concerns over quality of care at the Cincinnati VA Medical Center. ORIGINAL REPORT: Did Cincy VA balance budget by cutting care? 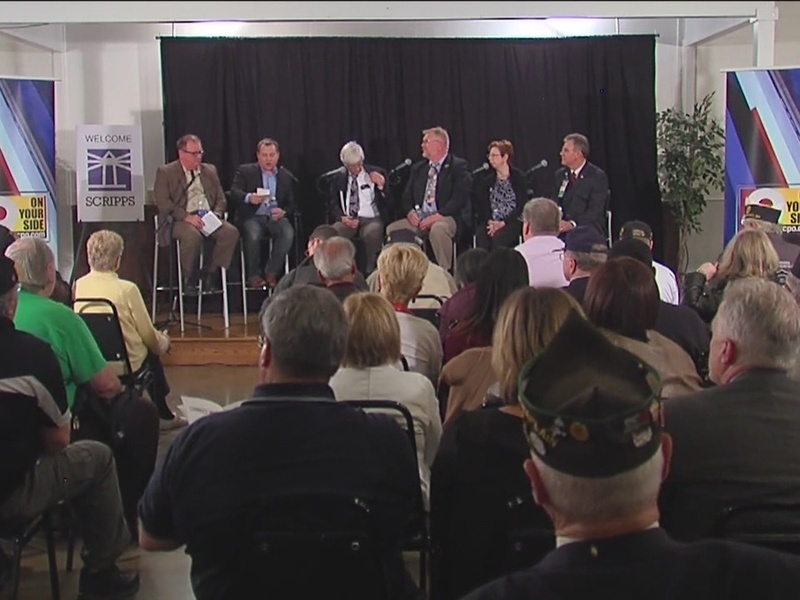 The town hall, moderated by WCPO digital reporter Dan Monk and Scripps national correspondent Mark Greenblatt, gave area veterans the chance to express their concerns to new VA leadership as well as whistleblowers who first came to WCPO last fall with worries of their own over the quality of care the agency’s Cincinnati facility was providing area vets. The prevailing question: What is the Cincinnati VA’s path forward? Put in the spotlight most frequently throughout the evening’s discussion was also the newest to the area, panelist and now Acting VA Division 10 Regional Director Robert McDivitt, who joined the regional administrative team in February, after the ouster of former regional director Jack Hetrick . The general concerns put toward McDivitt regarded how he planned to improve staffing levels, provide care up to medical standards, and — most importantly to veterans in the room — when will area veterans begin to notice changes at the troubled facility? Because he has only been serving in his current role for less than two months, McDivitt didn't provide many specifics, and instead focused on listening to area veterans and VA employees, and describing his priorities. Regarding staffing levels, fellow panelist Dr. Richard Freiberg — former chief of orthopedics at the hospital — did not mince words with McDivitt regarding what he described as the “evisceration” of his department when former chief of staff, Dr. Barbara Temeck, took over in 2013. Freiberg, now in his 80s, said he came out of retirement to help the understaffed department he once ran. This comment elicited numerous “Thank you’s” from the crowd. Panelist Susan Ware, nurse practitioner in neurology at the Cincinnati facility for more than 16 years, also echoed staffing concerns initially reported to WCPO when it began its investigation with Scripps last fall. Part of the problem, Ware said, arises from insufficient government funding for the VA — a point with which other panelists agreed. Ware said that the average starting salary for a neurosurgeon with the VA — around $350,000, she said — is dwarved by comparable positions in the private sector, starting salaries for which could reach as high as $1 million. “How are we supposed to recruit people?” she asked. But when moderators asked McDivitt if staff vacancy rates were a problem at the facility, the current acting director balked. When it comes to filling administrative positions — like chief of staff, for instance — McDivitt expressed optimism, saying a community-wide search committee for chief of staff has already begun its nation-wide search. When asked why Dr. Temeck — who relinquished her post and had her Drug Enforcement Agency certification to prescribe controlled substances revoked after she was found to have prescribed hydrocodone and a generic form of Valium to Hetrick’s wife without due authorization — was still taking a salary upwards of $300,000 from the Cincinnati VA, McDivitt pointed to her right to due-process as a federal employee. “Until those investigations are completed, there won’t be final action on that,” he said. The urgency here was reflected during the town hall, as veteran after veteran stood up and told his or her story of waiting months, sometimes years, for access to secondary care, such as specialized procedures or surgeries. Dr. Freiberg empathized with those in the audience, blaming hospital administration. McDivitt quickly and repeatedly pointed to the recently passed Choice Act, which was passed to create opportunities for veterans to receive care otherwise unavailable at their local VA facility from other community health care partners. It’s been a process that the WCPO/Scripps investigation found seems to have fallen short, a point to which McDivitt admitted Wednesday, saying, moving forward, he is committed to working to strengthen those partnerships. But as the Choice program has progressed so far, as far as Ware is concerned, the results haven't been promising. “For months my phone rang from scared, angry veterans and scared, angry providers,” she said, citing confusion that she and others have said surrounds the Choice program. “The VA is in an environment in which we need to be a good community partner,” McDivitt said. The panel's three whistleblowers — who stand among more than 30 who came forward for WCPO/Scripps’ investigation — gave similar reasons for speaking out: They felt the Cincinnati hospital was not providing the quality care veterans deserved, they said. Are These Concerns Even Being Heard? Perhaps the town hall’s most emotional moment came from a current staffer at the Cincinnati facility, Certified Surgical First Assistant Scott Landrum, who said he personally filed a number of the initial reports indicating that surgical equipment had not been properly cleaned or disposed of before orthopedic surgeries, sometimes containing bone fragments from prior procedures when used in the operating room. "I'm concerned for my job," Landrum continued. "This is ridiculous. The only person who has seen more bone than me at this hospital is Dr. Freiberg." McDivitt told Landrum that those findings were still just preliminary, and final results of the investigation were still pending. McDivitt also offered to stay after the town hall to discuss those reports with Landrum. Ultimately, hearing concerns like these is McDivitt’s primary goal, he said. “We’re here to listen to the voice of the veterans and of the employees,’ he said. Several audience members asked if the VA would go back to holding town hall meetings, similar to that held Wednesday evening. Have more to add to the conversation? We've set up a web page for you to voice your opinions, questions or concerns. Click or tap here .